The task of diesel fuel purification arises at the stage of its production, when it is necessary to get rid of water and solid impurities. Upon completion of the production process, the risk of contamination pursues diesel fuel from the refinery to the storage containers of the equipment in which it is applied. Water has a negative impact on the quality characteristics of diesel fuel, especially being in an emulsified state. Speaking about refineries, it is worth noting that diesel fuel is purified there using conventional methods of destabilization of emulsions, which include centrifugal, gravity, electrical and chemical approaches, as well as filtering through special membranes. Ultrasound and magnetic field impact on diesel fuel is also used, but much less. Settling can be used only as a preliminary treatment stage, since it does not allow to remove minor impurities and get rid of water completely. In this regard, centrifugal separators are more promising, but their use is characterized by high energy costs, and the equipment itself is expensive. In addition, adjustment and maintenance of separators is complex and labor-intensive. When removing solids, conventional fibrous filters show good efficacy, but they are not able to ensure complete removal of water. In recent years, there are more and more coalescing filters, which are good at water separation. However, these devices do not show adequate efficacy at presence of large amount of impurities in diesel fuel. Furthermore, they are prone to rapid clogging and are very difficult to regenerate. If a small amount of water must be removed, it is possible to apply the method of spray drying under vacuum. The essence of this approach is as follows. First of all, the contaminated fuel is sprayed through a nozzle into a tank where vacuum is created. This allows removing free and dissolved moisture from the oil product, as well as dissolved air. After dehydration, the fuel is deposited on the bottom of the vacuum tank in the form of droplets. The speed and effectiveness of the process depend on the temperature and rise at its increase. In general, vacuum systems are more reliable and powerful than separators. However, they are not without drawbacks. Vacuum treatment does not allow to get rid of solids and has low performance (usually no more than 0.5 tons/hour). Dehydration of oil products may also be carried out by quicklime. Moistened diesel fuel is fed into an adsorber filled with quicklime, at a relatively low rate, at 18-20ºC. For dehydration, you will need the amount of quicklime which makes up to 0.2% of the feedstock volume. Flakes, formed as a byproduct of this oil purification, are separated from fuel by means of settling or oil filtration. The disadvantage of this method is that quicklime is not suitable for use with some types of fuel, and it is necessary to perform a preliminary check of compatibility in a lab environment. To date, the use of quicklime for diesel fuel purification is not sufficiently studied. Synthetic zeolites can also be used for dehydration of fuels. Sometimes they are referred to as molecular sieves. They absorb water from fuel, which is then removed from the sorbent by heating. The main difficulty is the selection of the optimum temperature, as overheating can result in a breach of the zeolite structure, which hinders its further use. Dehydration with zeolites will cost several times cheaper than operation of a centrifugal separator. It is obvious that an optimum solution of the task of diesel fuel purification of water and mechanical impurity is possible only by combination of various methods. This makes it possible to achieve the best performance of the process in terms of energy efficiency, productivity and cost. This is the approach used in UVR-type plants manufactured by GlobeCore. They allow to perform purification, clarification and restoration of absolutely all light fractions of petroleum products (diesel fuel, gasoline, kerosene, heating oil, as well as different types of oil). During diesel fuels cleaning process, the UVR-type plant removes water, mechanical impurities and hydrogen sulfide compounds, reduces the concentration of sulfur, lowers paraffins content and removes unsaturated hydrocarbons. 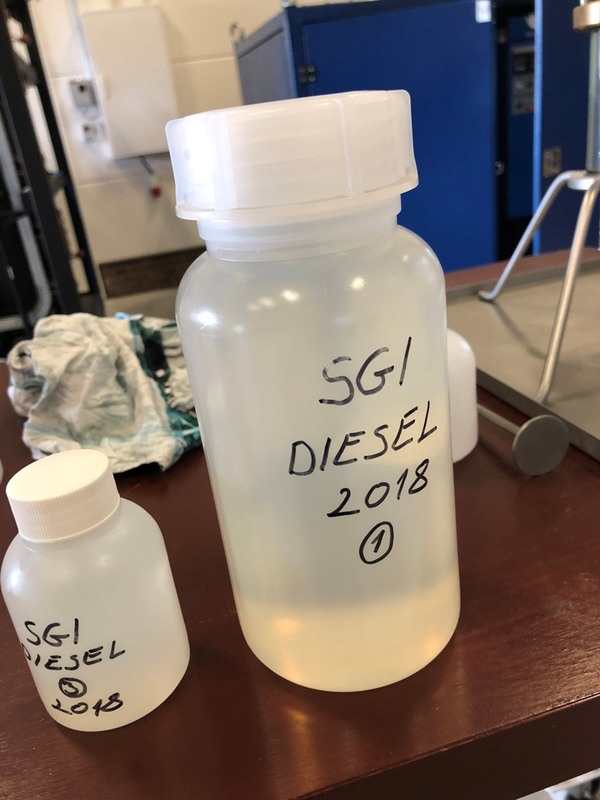 After processing by GlobeCore equipment, diesel fuel does not oxidize or darken again. Versatility. The equipment can be used for purification and clarification of not only diesel fuels but also other petroleum products without any complex manipulations.